Since returning from our Fulbright semester, Richard and I have become the go-to resources for friends seeking advice on travel to Portugal. Around New Year’s my friend and fellow critique group member in Albany, Linda Marshall, contacted me about going to Lisbon and Evora. While I could give her a list of things to do in Lisbon, I was embarrassed to admit that I had never traveled to Evora, a popular tourist destination because of the Roman ruins and medieval chapels and cathedrals. We kept meaning to go but heard that it was difficult to get to. 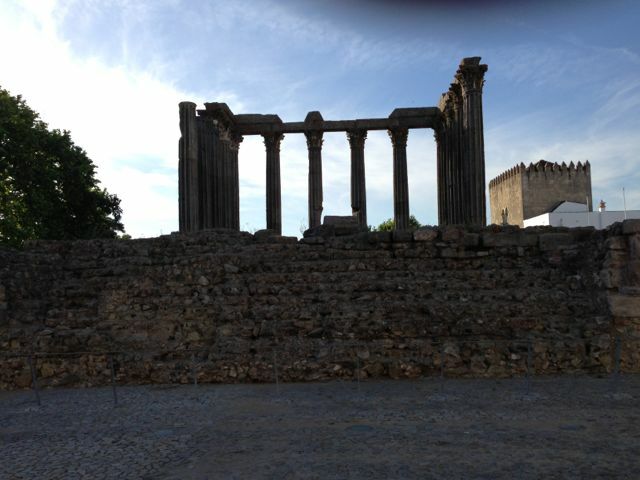 A principal attraction of Evora is the Roman Temple of the Goddess Diana. After asking other people from the U.S. who’d been there, I advised Linda and her husband to rent a car for the trip. In the end, their plans changed and they never made it to Portugal at all. But in the interests of her “next-time” pledge and anyone else seeking advice, Richard and I decided to add Evora to our itinerary this past spring. We reserved an inexpensive but attractive-looking hotel, the Evora Inn Chiado Design, and checked bus and train schedules. While we advised our friends to rent a car, we generally avoid driving altogether and prefer public transportation to taxis. We’d much rather save the money, to spend it on great restaurants instead. We discovered that the Rede Express bus leaves every couple of hours and is thus a better choice than the train, which run only a few times a day. The bus takes a scenic route through the Alentejo countryside, but if you want to stop in various small towns along the way and look around (or enjoy a traditional meal), renting a car would be the better choice. 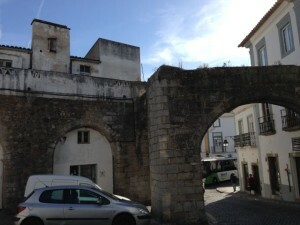 The ancient Roman aqueduct cuts through the center of Evora. The hotel was a bargain, with attractive rooms and a helpful staff. We didn’t take the breakfast package because there are a number of bakeries on the square that the hotel faces. Unless you don’t mind noise, request a room in the back, because that square is quite lively at night. At the same time, this town does boast a late night scene, with cafes and kiosks in the various squares and parks. They are pleasant places to sit during the day as well, as the people enjoy their midday break from the hot sun. Most stores and other businesses close from 12:30 until 2:30. 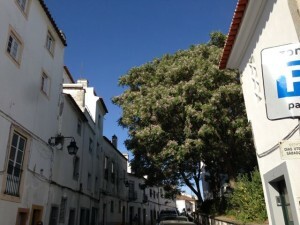 A typical narrow Evora street, with old buildings and a perennially blue sky. With most of the town located within medieval walls, Evora is easily walkable, and visitors can see attractions from various centuries, from the Roman Temple of the Goddess Diana and the aqueduct onward. 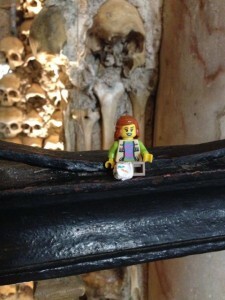 We saw the Chapel of Bones, where Franciscan monks worshiped amid visible evidence of the transitory nature of life. 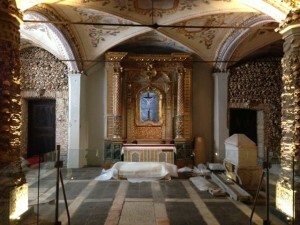 The inscription at the chapel’s entrance reads: Nós ossos que aqui estamos pelos vossos esperamos (“We bones that are here, for yours we wait.”) The adjacent church was under renovation at the time we visited, but we could see some of the restoration work and get a glimpse of its former and future splendor. 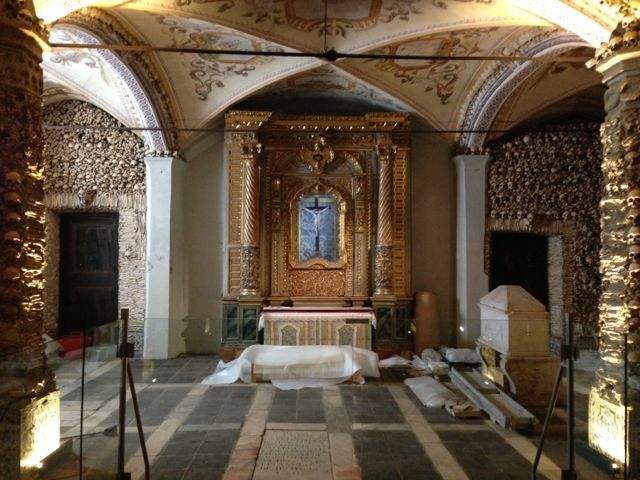 Human bones and skulls decorate the Chapel of Bones. 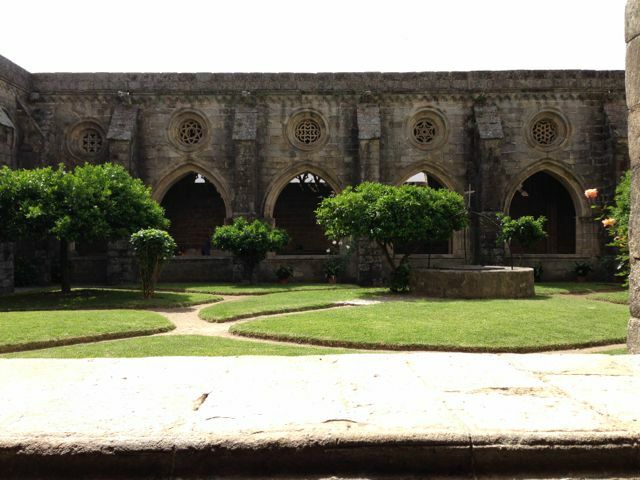 Along with other churches and a small university dating from the sixteenth century, we toured the Palace of the Dukes of Cadaval and the Lóios Convent, built in the seventeenth century on the site of a ruined palace from the 1300s. The collection of manuscripts on the palace’s ground floor attest to the wealth and privilege of the palace’s owners. Recovering from an accident, Siggy contemplates what could have happened. We also saw evidence of more modern wealth and privilege, in the form of expensive designer stores in the town’s center and real estate listings for country homes and mansions in the area. It appears that Evora and its immediate surroundings have become, like the Algarve (which we still haven’t visited) a vacation spot for people from the U.K. and other places seeing to escape their dark, cold, rainy winters. The shops seemed more stodgy and traditional than those in Porto and Lisbon, and more family-oriented as well. I even saw a high-end toy store that was closed the entire time I was there. I expect it’s open by now for high season; although the weather was quite hot on days we were there, it was still a little early for the end of school and the arrival of the summer vacationers. The town had an expectant feel, though, with repairs in progress and places announcing longer hours. 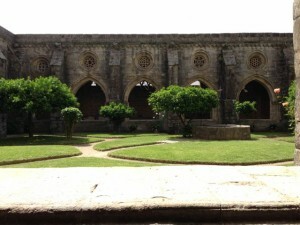 The garden at the Loios Convent. I’m glad we had the opportunity to visit both Evora and Coimbra on this trip and encourage other visitors to spend at least a night in each place. Unfortunately, they’re not near each other — though Coimbra is on the way from Lisbon to Porto, and Evora is convenient for those driving between Portugal and Spain. And both are quite reachable by public transportation, the most environmentally-friendly way to go. Sounds like a great place to visit. I’d love to see the medieval chapels and the ruins.